The Department of Neurosurgery at Weill Cornell Medical College offers a research fellowship in endoscopic skull base surgery. This position helps fill the need many neurosurgeons-in-training have for in-depth exposure to advanced minimally invasive techniques. Participating fellows will observe cases in the operating room and be involved in research projects including clinical reports and cadaveric dissection in the Weill Cornell Medical College’s advanced Surgical Innovations Laboratory for Skull Base Microneurosurgery. The major objective of this neurosurgery fellowship is to advance the field, improve safety, and further define the surgical indications of skull base endoscopic neurosurgery. Investigative efforts will be distributed through published peer-reviewed works for the benefit of neurosurgeons worldwide. Participants are expected to spend a minimum of three months and will receive a stipend that is dependent upon their level of training. 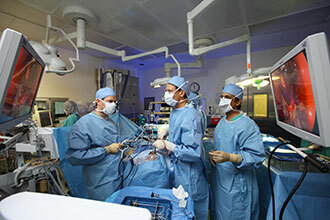 The fellowship focuses on transnasal approaches to skull base surgery, under the supervision of Dr. Theodore Schwartz, Professor of Neurological Surgery at Weill Cornell Medical College and Director of the Center for Epilepsy and Pituitary Surgery and Co-Director of Surgical Neuro-oncology at the Weill Cornell Brain and Spine Center. Contact Dr. Schwartz for more information about this fellowship at 212-746-5620. See also our observership in intraventricular neurosurgery, under the direction of Dr. Mark Souweidane, Vice Chairman of the Department of Neurosurgery at Weill Cornell Medical College and Director of Pediatric Neurosurgery at the Weill Cornell Brain and Spine Center.